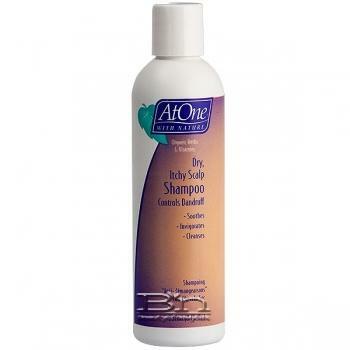 AtOne Dry, Itchy, Scalp Shampoo Controls Dandruff. Soothes. Invigorates. Cleanses. Helps improve the feel and appearance of dry, itchy scalp. Gentle cleansers wash away loose flakes, leaving the scalp feeling invigorated and tingling fresh. Natural ingredients have been carefully blended to moisturize the hair and scalp and to help counteract the dryness which can cause itching. This superb treatment shampoo contains balanced levels of conditioners to leave hair soft, manageable and shining.